Web platforms installed in one click…seriously. Ok I’ve seen all the announcements and read all the buzz. I know some folks on the team as well and had heard all their raving about their offering. It wasn’t until today where I really realized what was going on. In fact I was thinking about titling this post: WordPress installed and configured in under 5 minutes, but it’s much more than just that. 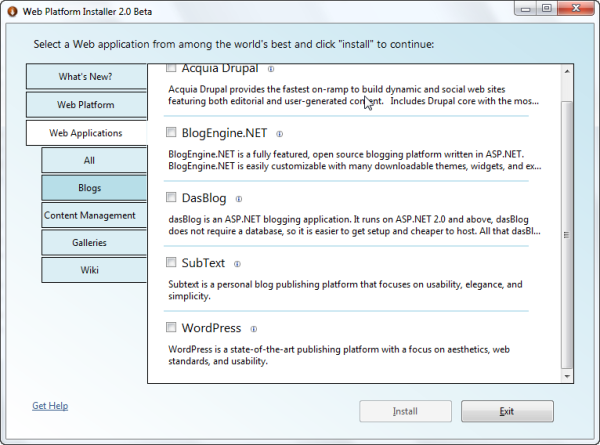 Introducing: Web Platform Installer 2. The team at Microsoft has been working hard to make getting your web platform (server and client) up and running quickly and taking any pain out of the process. In one click you can have Visual Studio and Silverlight Tools installed, IIS7 configured, Smooth Streaming enabled, etc. That’s right, WordPress as an offering. 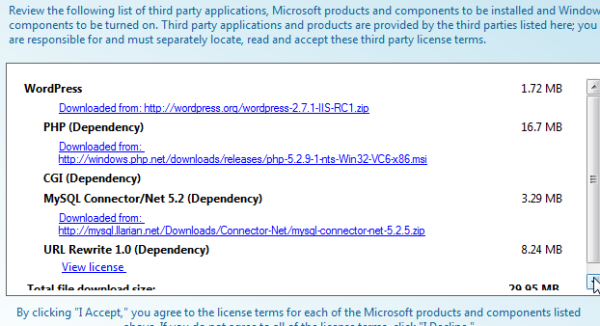 No, not some hacked “run as .NET” version of WordPress. The real deal from the WordPress project site…Microsoft hosts nothing but a simple manifest describing the project. I selected WordPress and the tool knew what was missing from my environment: MySQL, PHP, FastCGI, etc. I clicked “install” and literally in about less than 10 minutes I was running WordPress. I’m not saying “installed” or downloaded. In fact most of the time of that 10 minutes was from downloading the various bits. When the “You’re finished” message came up, I had a working WordPress site, configured to MySQL, configured with a content database, etc. I had to do nothing to configure my MySQL settings, I had to do nothing to my get PHP running on my site…WebPI did it all for me. It was totally friction free. It’s not just WordPress either. Drupal, Umbraco, DasBlog, Subtext, ScrewTurn Wiki, etc. And you can put your app there as well. It really is a great resource not only for server components but also for client web platform stuff like I mentioned previously for Visual Studio and Silverlight developer tools.